Having cracked the impossible by establishing itself as a genuine alternative to the mainstream, Hyundai’s next challenge is to prove that it has what it takes to tackle electrification. The result is IONIQ, a mid sized hatchback with a unique selling point; you get to choose between petrol / electric hybrid, petrol / electric plug-in hybrid, or pure electric derivatives. In hybrid form you get a 1.6 litre normally aspirated engine which uses direct injection and the Atkinson cycle to achieve record beating 40% thermal efficiency. Designed to work with a 43 bhp electric motor, the petrol unit is tuned for maximum efficiency with the motor picking up the slack. Unusually the gearbox is a 6 speed dual clutch system, rather than a CVT or e-CVT favoured by Toyota, whilst the 1.56 kWh battery pack is lithium-ion rather than Nickel Metal Hydride. Hyundai provide an 8 year 125,000 mile warranty for the battery and 5 year unlimited mileage cover for the whole car. Encouragingly Hyundai has aimed to produce a hybrid that you will want to drive; multi link rear suspension, high strength steel (53% of body), aluminium bonnet, tailgate and suspension, an energy dense space saving lithium-ion battery, DCT gearbox and a low centre of gravity all help to make the case. But does it translate to the road? Yes and no. The IONIQ hybrid is more fun than a Prius and certainly doesn’t disgrace itself in the twisty stuff but it falls short of being genuinely entertaining. 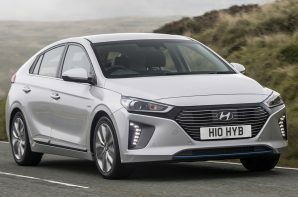 If you get a chance to try the pure electric version it quickly becomes apparent that it does a better job of meeting the original brief, but in terms of hybrid competitors the IONIQ is the most rewarding to drive. Although the IONIQ falls into our Small Family Car section it isn’t that much smaller than the Toyota Prius (check out Family Cars) and it is easy to see customers seriously comparing the two. If you don’t need the extra space the IONIQ is the pick of the two, offering more fun and better looks at a substantially lower price.